Movement of large aircraft about the airport, flight line, and hangar is usually accomplished by towing with a tow tractor (sometimes called a “tug”). [Figure 1] In the case of small aircraft, some moving is accomplished by hand pushing on the correct areas of the aircraft. Aircraft may also be taxied about the flight line but usually only by certain qualified personnel. Towing aircraft can be a hazardous operation, causing damage to the aircraft and injury to personnel, if done recklessly or carelessly. 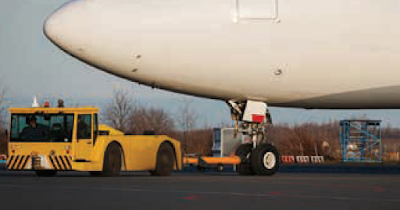 This article outline the general procedure for towing aircraft. However, specific instructions for each model of aircraft are detailed in the manufacturer’s maintenance instructions and are to be followed in all instances. Before the aircraft to be towed is moved, a qualified person must be in the flight deck to operate the brakes in case the tow bar fails or becomes unhooked. 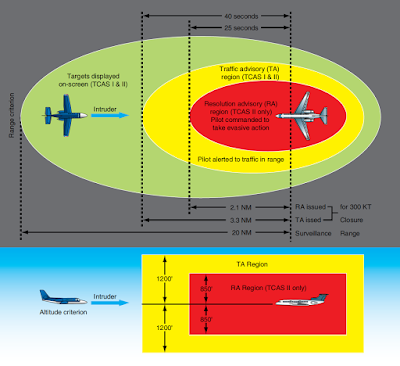 The aircraft can then be stopped, preventing possible damage. Some types of tow bars available for general use can be used for many types of towing operations. [Figure 2] These bars are designed with sufficient tensile strength to pull most aircraft, but are not intended to be subjected to torsional or twisting loads. Many have small wheels that permit them to be drawn behind the towing vehicle going to or from an aircraft. When the bar is attached to the aircraft, inspect all the engaging devices for damage or malfunction before moving the aircraft. Some tow bars are designed for towing various types of aircraft. However, other special types can be used on a particular aircraft only. Such bars are usually designed and built by the aircraft manufacturer. When towing the aircraft, the towing vehicle speed must be reasonable, and all persons involved in the operation must be alert. When the aircraft is stopped, do not rely upon the brakes of the towing vehicle alone to stop the aircraft. The person in the flight deck must coordinate the use of the aircraft brakes with those of the towing vehicle. A typical smaller aircraft tow tractor (or tug) is shown in Figure 3. The attachment of the tow bar varies on different types of aircraft. Aircraft equipped with tail wheels are generally towed forward by attaching the tow bar to the main landing gear. 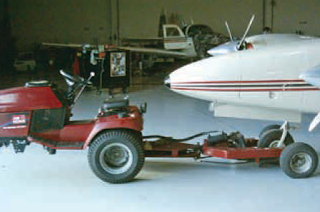 In most cases, it is permissible to tow the aircraft in reverse by attaching the tow bar to the tail wheel axle. Any time an aircraft equipped with a tail wheel is towed, the tail wheel must be unlocked or the tail wheel locking mechanism may damage or break. 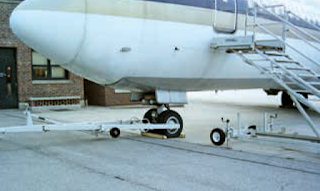 Aircraft equipped with tricycle landing gear are generally towed forward by attaching a tow bar to the axle of the nosewheel. They may also be towed forward or backward by attaching a towing bridle or specially designed towing bar to the towing lugs on the main landing gear. When an aircraft is towed in this manner, a steering bar is attached to the nosewheel to steer the aircraft. The following towing and parking procedures are typical of one type of operation. They are examples and not necessarily suited to every type of operation. Aircraft ground-handling personnel must be thoroughly familiar with all procedures pertaining to the types of aircraft being towed and local operation standards governing ground handling of aircraft. Competent persons that have been properly checked out direct the aircraft towing team. The towing vehicle driver is responsible for operating the vehicle in a safe manner and obeying emergency stop instructions given by any team member. The person in charge assigns team personnel as wing walkers. A wing walker is stationed at each wingtip, in such a position that he or she can ensure adequate clearance of any obstruction in the path of the aircraft. A tail walker is assigned when sharp turns are to be made or when the aircraft is to be backed into position. A qualified person occupies the pilot’s seat of the towed aircraft to observe and operate the brakes as required. When necessary, another qualified person is stationed to watch and maintain aircraft hydraulic system pressure. The person in charge of the towing operation verifies that, on aircraft with a steerable nosewheel, the locking scissors are set to full swivel for towing. The locking device must be reset after the tow bar has been removed from the aircraft. Persons stationed in the aircraft are not to attempt to steer or turn the nosewheel when the tow bar is attached to the aircraft. Under no circumstances is anyone permitted to walk or to ride between the nosewheel of an aircraft and the towing vehicle, nor ride on the outside of a moving aircraft or on the towing vehicle. In the interest of safety, no attempt to board or leave a moving aircraft or towing vehicle is permitted. The towing speed of the aircraft is not to exceed that of the walking team members. The aircraft’s engines usually are not operated when the aircraft is being towed into position. The aircraft brake system is to be charged before each towing operation. Aircraft with faulty brakes are towed into position only for repair of brake systems, and then personnel must be standing by ready with chocks for emergency use. Chocks must be immediately available in case of an emergency throughout any towing operation. To avoid possible personal injury and aircraft damage during towing operations, entrance doors are closed, ladders retracted, and gear-down locks installed. When moving aircraft, do not start and stop suddenly. For added safety, aircraft brakes must never be applied during towing, except upon command by one of the tow team members in an emergency situation. Aircraft are parked in specified areas. Generally, the distance between rows of parked aircraft is great enough to allow immediate access of emergency vehicles in case of fire, as well as free movement of equipment and materials. Wheel chocks are placed fore and aft of the main landing gear of the parked aircraft. Internal or external control locks (gust locks or blocks) are used while the aircraft is parked. Prior to any movement of aircraft across runways or taxiways, contact the airport control tower on the appropriate frequency for clearance to proceed. An aircraft parked in a hangar must be statically grounded immediately.